Virender Sehwag has cautioned against drawing parallels between Virat Kohli and Sachin Tendulkar. 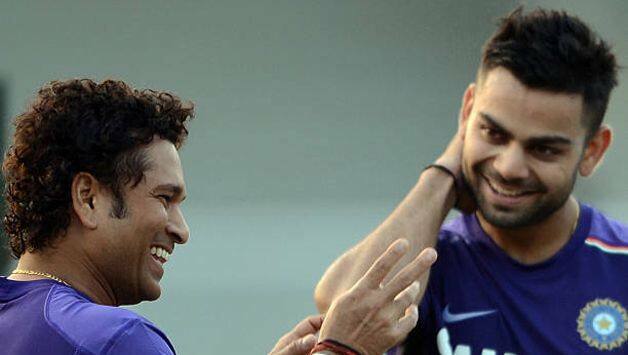 Virat Kohli has been often compared with batting legend Sachin Tendulkar for their shared hunger of scoring runs. The rate at which Kohli has been peeling off centuries across Tests and ODIs, it seems he might end up replicating Tendulkar’s record of 100 centuries in international cricket or may even surpass it. But former India opener Virender Sehwag has cautioned everyone against drawing parallels between the two batsmen saying Kohli should first achieve what Tendulkar did in his 24-year-long career. If what Kohli has managed to achieve in his decade-long international career is anything to go by, then surely he looks in the driving seat to emulate the success of his cricketing idol. In 69 Tests so far, Kohli has scored 5994 runs at 54.49 with 23 centuries and 18 half-centuries. In ODIs, he has 9779 runs at 58.20 including 35 hundreds and 48 fifties. Tendulkar, who retired in 2012, scored 34357 runs across formats with 100 centuries and 164 half-centuries. Sehwag, who is credited with changing the definition of batting in Test cricket, feels Kohli has the requisite talent and discipline to achieve the milestones set by Tendulkar. “He (Kohli) can do it as he has the talent and the hunger required to achieve these milestones. It becomes clear after you see the way he prepares and focuses on each match disregarding whatever happened in the previous one,” he said. He also claimed that there isn’t a better batsman than Kohli across the three formats currently and he’s an inspiration for cricketers from around the globe. “A player becomes great only if he prepares well for each and every game. Today there is no one better than him in all three formats. He is an inspiration for players around the world. Even international players, when I talk to them in IPL, they talk about Kohli and his successful method”, he said. India, who are in the midst of their five-Test series against England, have kept the series alive with a 203-run win at Trent Bridge. They have cut down England’s lead to 2-1 and will be hoping to make it 2-all at the The Rose Bowl, Southampton. Kohli has never played with the same playing XI in his 38 Tests as India captain. Sehwag opines that Kohli should play with the same team that took field at Trent Bridge as everything is clicking for the team right now. “It is difficult to say that there won’t be any changes. I personally don’t want changes for the next Test but he (Kohli) might not. The team looks balanced and strong with a good pace attack and Ashwin in good form. 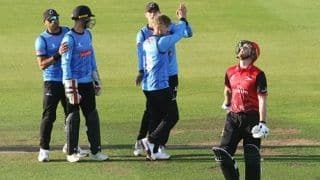 The openers are doing well and the middle order also played well at Trent Bridge. KL Rahul, Rishabh Pant and Kohli were phenomenal with their catching which was a big factor in the win. During my playing days we had an experienced slip cordon filled with greats like Rahul Dravid, VVS Laxman and Tendulkar who hardly dropped catches,” he said.